Ever since I was a little girl, I have always loved Halloween. Not the bloody, gory kind but, the ghostly, spooky kind. I never had the desire to decorate until after the birth of my son and our move into our current home in 1991. 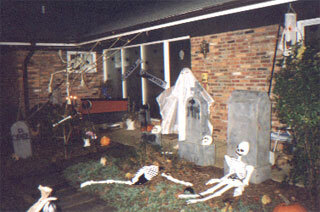 My initial decorating was not very spooky (stuffed pre-printed bags, McDonald's meal toys, corn stalks, pumpkins, etc.). But as my son got older, I started putting up more scary decorations. Every year I'd go to the stores looking for the latest stuff. As a result I have gone from one small box of decorations to 5 large boxes and a garage storage area full of homemade tombstones and other large display items. 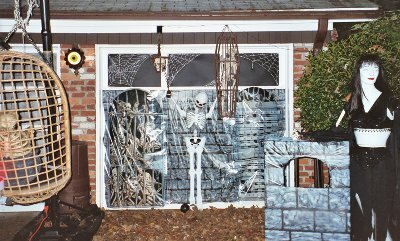 Everyone in the neighborhood refers to our home as the 'Halloween House' and even people who have moved away come back on Halloween night to see what's new. I start decorating October 1st. 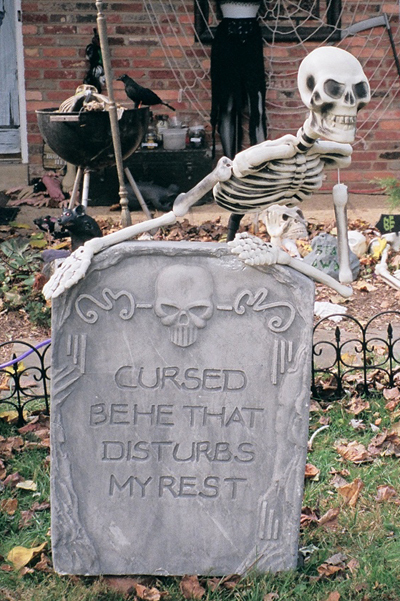 I have plenty of screaming mats, a graveyard, a coffin with a stuffed body where the kids get their treats, flying/wiggling ghosts, flying bats, wiggling hands, skeletons, assorted bones and body parts, and a bubbling cauldron. I usually have between 5 and 10 carved pumpkins (using Pumpkin Masters templates) and place them lining the right side of the driveway. In 2001 I added fog machines for the first time. Until I adjusted it, I fogged over 2 of my neighbors yards (you couldn't see to walk down the driveway). But after adjusting, it added a spooky atmosphere to my display. The second fogger was hidden under the cauldron and I would set it off as people left. 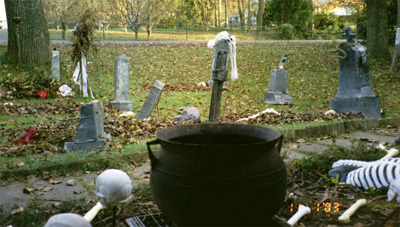 I also added two tall torches near the cauldron and built two sections of fence for my graveyard and rearranged the display. (Fogger Advice: BUY A TIMER!!! More Fog Advice: FOG RUINS PHOTOGRAPHS!!! The fog reflects the flash and it washes out your pictures.) In 2002 I added 5 more torches for a total of seven. They are now an intricate part of the display (Fire is a great effect). I built and used a 'Chiller' (see www.halloween-online.com for instructions) for my fog machine but I still couldn't get the fog to hug the ground. In 2003 I created my Torture Chair. 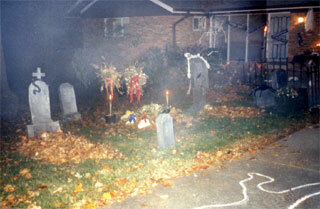 2004 was witness to an major expansion/upgrade of the Graveyard!!! Due to the deterioration of my cardboard tombstones, I bought a bunch of foam tombstones and made a couple as well. I've built 2 more fence sections (totaling 4 now) and 2 entrance columns for the graveyard. 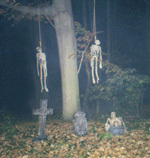 I've added a Gallows and placed my two "hanging" skeletons there. I've taken my favorite pumpkin patterns and craved them on Styrofoam pumpkins. This reduces the number of real pumpkins I need to carve each year. I'll still do a couple real ones. 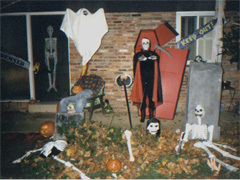 I got very ambitious in 2005 making new props and completing my Hollyween vision. Over the summer I rearranged the furnishings in my living room and dining room and based on the changes I started thinking about redoing the Funeral Parlor. I decided to add "guests" to the room (several different skeletons) and moved the coffin between the living room and dining room, out of site from the front door. To add more atmosphere, I bought a bunch of white sheer curtains (Thrift store) to hang over the very large living room window. I run a hidden fan to make them move and billow. With the new Cemetery Gates and the purchase of many new tombstones, I realized I needed to reorient the graveyard for a better presentation. 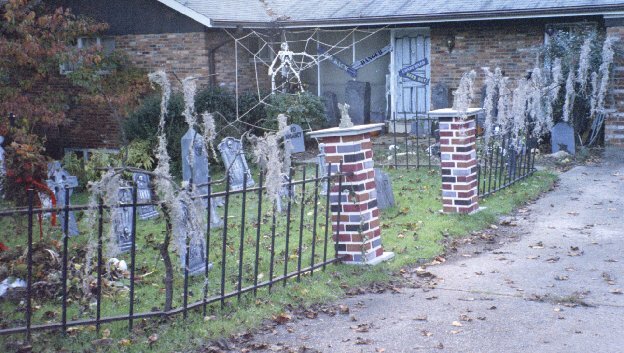 The Graveyard entrance now faces the street and the trick-or-treaters enter by walking through the graveyard and exit out the driveway. I've always thought my garage doors did nothing to add to the display. Well, no longer... 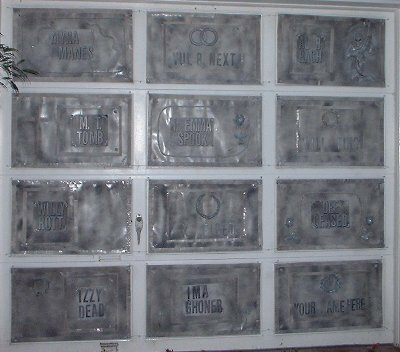 I've turned one of my two 12 panel garage doors (left side) into the Hollyween Memorial Mausoleum. Some of the new props I bought were torture/dungeon-oriented so I decided to turn the other garage door area into the new Dungeon (delineated by the Torture Chair and Gallows). This is where you'll find the new Mistress of the Dungeon prop I worked on all summer next to the jail-like Standee created for photo-ops. Also in 2005 I participated in my 1994 Polo Green Corvette Convertible with the Northern Virginia Corvette Club in the 59th annual Vienna Halloween Parade. I decorate my car with webs, spiders, skeletons and bones and ended up leading the club! Click the link to read about my experience. All I can say is WOW! 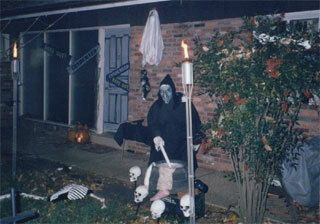 Only one new prop created for 2007, the Skeleton Lawn Jockey but I had my usual good time on Halloween night. Had one visitor who came all the way from South Carolina to visit my haunt! I had 9 crawling hands in the Funeral Parlor and everyone loved them! Finally got smart and placed a 2x4 under the front of the couch to keep them from getting lost. I was dressed as a skeleton this year. All my problems from last year were non-existent this year. The cauldron mist'r worked fine. I purchased a little dry ice and would add some occasionally. The Haunted Mansion CD worked great and was a perfect addition in the funeral parlor. 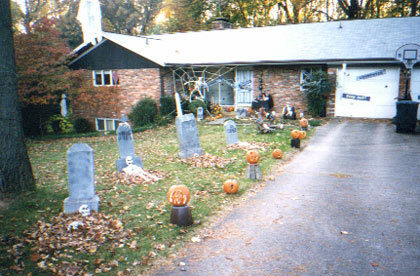 The pumpkins from the totem pole were spread among the others on both sides of the driveway. Halloween came early for me in 2008 . I was interviewed on Oct. 16th by Woody Irvin for a Washington Post article on Home Haunts in Fairfax County. Because of the interview, I had to have the outside set up for his visit. I have never had it set up so early and the neighbors loved it. I got to meet so many of them and talk out of character. 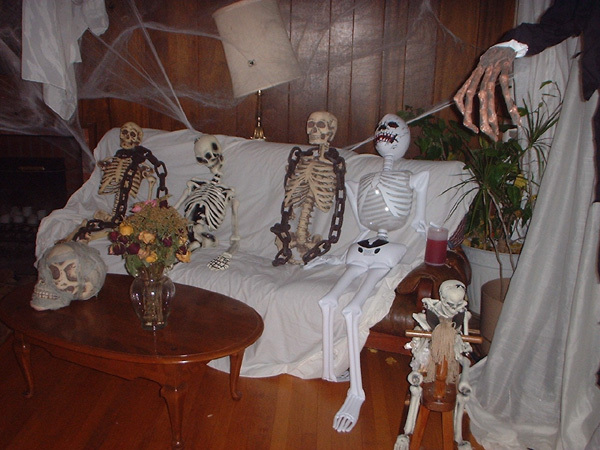 I had non-stop visitors on Halloween night, many cited the news article. I ran the haunt three nights because of the publicity, but doubt I'll do that again. I could only get 3 of my crawling hands to work but it was enough to entertain visitors. The biggest hit was a new purchase, a skeleton candy dish that had a hidden hand that came out and shook over the bowl. People played with it all night. I carved one new pumpkin and expanded the potions with unique bottles I purchased from thrift stores. The Mistress of the Dungeon stayed on the porch with her arms caught in a spider web and looked great there. She may have a new home. I worked hard to get the two new props finished in time and neither worked! Oh well, now I have a whole year to try get them working. Overall, Halloween was a howling success and the entire neighborhood was understanding of the traffic and proud of my haunt's deserved notoriety. Halloween 2009 was another howling success. Because I had so many carved pumpkins, I decided to add a new haunt section, the Haunted Pumpkin Patch, and placed almost all of my pumpkins there. My brother and his kids helped with the haunting on Halloween night. My niece, the vampire, greeted guests at the cemetery entrance and warned them about what awaits them. My brother, the grim reaper, stood perfectly still in the graveyard. He held an heirloom sickle that belonged to our grandfather over his head. 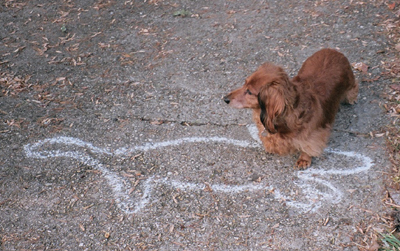 If you tried to step off the path, he would shout "get out of my yard". My nephew was a scarecrow sitting in the back of the new Haunted Pumpkin patch. He frightened many young girls that night as he sat, unmoving, until someone would approach to see if he was real, then he would turn his head or stand up. I listened and laughed all night as visitors tried to determine if he was real, and him gently scaring them (He said it was the best Halloween/Birthday he had ever had!) 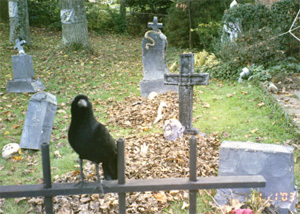 They also helped put the finishing touches on the graveyard and created a vultures-eating-bones scene on one side of the graveyard. As always, I met guests at the end of the graveyard and escorted them inside the funeral parlor telling them to make loud noises to wake the dead. I managed to get the Haunted Books working this year and everyone thought they were "so cool". 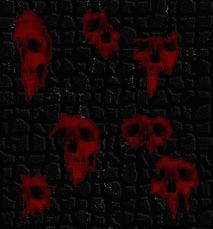 The new props I purchased at the Halloween Convention I attended in April, were sprinkled throughout the haunt. The new Witch prop was very real looking standing behind the smoking pot of Body-parts Stew with hands and feet hanging in baskets around her. I got some shelving that displayed my potions much better, allowing visitors to read all the labels of ingredients. The Bridge of Death signs were back after a two year absense. 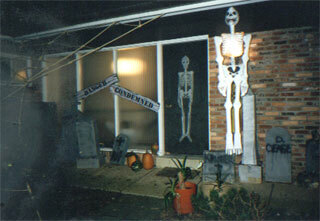 The large cardboard tombstones did not make an appearance this year. Rats ate the papermache off them and I never got the time to repair them. 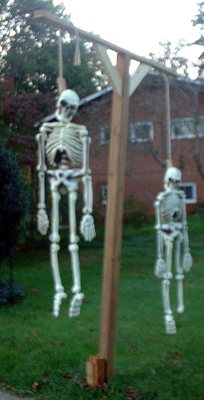 I think they are still viable though and hope to repair them before next Halloween. I ended up closing the Funeral Parlor on Nov. 1st because I was too exhausted and left visitors to peruse the outside haunt on their own. Since Halloween several of the neighbors have stopped by to say how much my family's participation added to the haunt. Maybe we should pool our money and open a year-round haunt? Hollyween 2010 - I built the caisson but didn't have the time to create the coffin-lid-lifting mechanism. Still it turned out great. The slope of the drainage ditch out front, turned out to be too great for my moat idea but, I was able to create a partial moat. The papermache tombstones are gone. They were just too eaten up to repair. Only purchase one new prop, a two-sided jack o' latern that stretches up and sideways while laughing eerily. 2011 - I ran only the outside haunt, resulting in a few disappointed visitors. 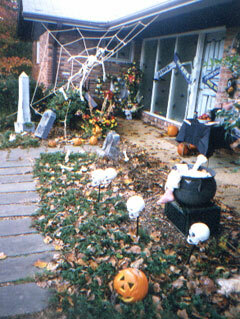 I did not have the path through the graveyard but went back to the driveway entrance/exit (safer for tots in costumes). 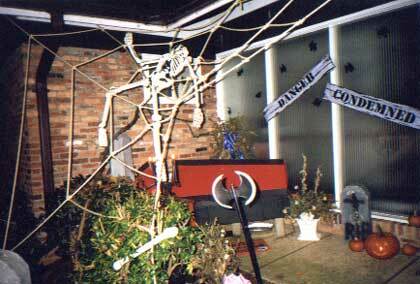 The coffin with the body and candy was moved outside under the giant spider web. 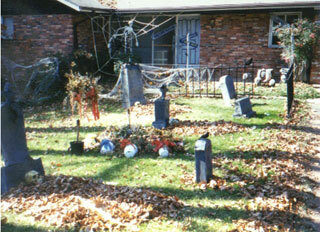 I extended the graveyard to both sides of the driveway and sprinkled the carved pumpkins throughout. The complete haunt is now for sale. $2500. 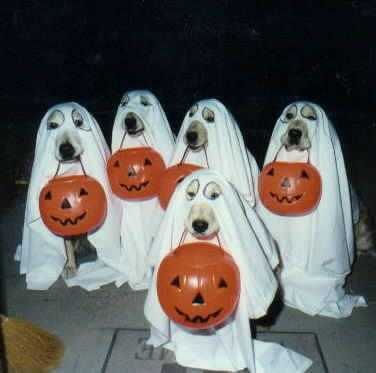 please go to http://www.hauntedhouseonline.com/ or Email HOLLYWEEN for directions to my haunt. Through the Cemetery entrance is the graveyard which is to the left of the driveway and includes a fresh(? ), dead-flower-covered grave. There are ghosts hanging from the trees and the lamppost made out of white sheer curtains. 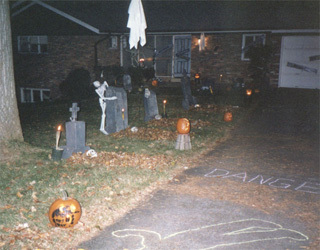 Lining the driveway on the right are carved pumpkins and two plastic skeletons "hanging" from the gallows. 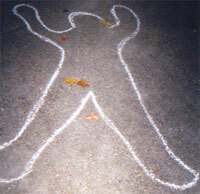 Chalk body outlines and messages are drawn on the long driveway (GO BACK, BEWARE, DANGER, (and a nod to Monty Python) RUN AWAY, etc.). Taped across the windows and door are more warning signs (KEEP OUT, CONDEMNED). "Squeal Appeal" is generate by strategic placement of screaming mats. Hanging from the basketball hoop in the driveway is the torture chair which delineates one side of the dungeon. This is where you'll find the Mistress of the Dungeon. To the left of the dungeon is the Hollyween Memorial Mausoleum with 12 very silly occupants. 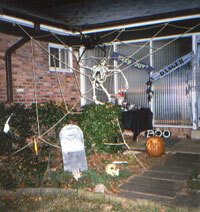 A giant spider web, with two giant spiders descending on another skeleton, is to the left of the front door. To the right of the door is a bubbling cauldron and cooking potions. A remote control ghost flies the length of the front porch. Flood lamps light the display. A fogger and several fiery torches complete the spooky effect. ... And then I add ME!!!! I know my display looks great when I hear the littlest ones yelling out in the street "No, No, Don't make me go there, Daddy!". The contents of these web pages are copyrighted by Holly Zell. Please ask before copying any text or graphics from these web pages.